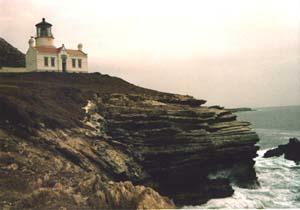 Point Conception Lighthouse in Southern California stands high on a bluff above the Pacific Ocean. It is on an isolated promontory far from civilization. It is locked away from civilization also, as a gate with seven locks stands across the road to the Point Conception lighthouse. The lighthouse is on the grounds of a large ranch, and as well as being protected by the seven locks, it is protected by security guards. It was through one of these guards we were first able to visit the lighthouse. 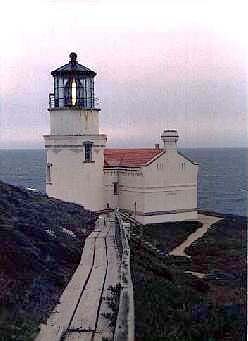 We had contacted the firm that owned the lighthouse, to no avail. They would not allow us on the property. 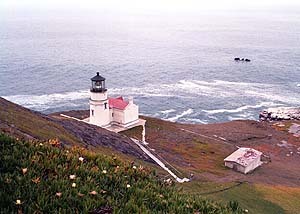 The Lighthouse is still an active aid to navigation and is maintained by the Coast Guard. They are allowed to drive the road to the lighthouse. We then contacted Coast Guard Headquarters in Long Beach, and we were told that a Coast Guard Aids to Navigation Team would take us in. Well, we drove the 65 miles from Santa Barbara to Jalama Bay to meet the Coast Guard Crew. They did not appear at the appointed hour. We waited and waited for several hours. We were several miles from the little restaurant at the State Park at Jalama Bay. Finally I left Bob standing at the gate, out in the wind and hot sun, waiting for the Coast Guard, and I drove to the Jalama Bay and called them. The Coast Guard Officer in Charge came on the line, and just told us he would not allow his crew to take us there, "that they had better things to do with their time." There have been only two times in all our quest that the Coast Guard let us down and this was one of them. Dozens of other times, our experiences with the Coast Guard have been wonderful. Anyway, discouraged and disheartened over coming so far and failing, we stopped at the Jalama Bay Cafe for what we now know as the famous Jalama Burger. (it was great, and ONE was enough for both of us.) The proprietor listened to our story, felt a little sorry for us and called his son in law, who was one of the security guards for the ranch. At first the son in law was a bit annoyed at being bothered on his day off, but his father in law pleaded for us. He finally agreed to take us to the lighthouse AFTER he finished a project he was working on. So, we stayed at Jalamla Bay all day, walking the beach, looking at shells, and many odd rocks that had holes in them. The roar of the surf calmed us. Bob, who enjoys tidal pools was in his element. Finally at about 5 PM (the light fading and a bit of rain sprinkling) the guard showed up. After his initial irritation, he turned out to be a very nice man, who went out of his way to show us the lighthouse. He couldn't believe the Coast Guard had left us sitting way out there waiting. We took photos of the lighthouse from every angle we could reach, and maybe some angles up on the cliff we shouldn't have reached. One slip, and one of these lighthouse photographers could have been history. We were told that Point Conception is one of the places where the Indians believe some of the power of the Earth comes through the crust. Even to folks like us, who know nothing about these kinds of things, we could feel it all around us. It was almost eerie, a feeling of being alone with the powers that be. A P.S. : Several years later we were out there and the head of security gave us the key to the gate and asked us to wait for him inside. Before he got there, the same Coast Guard team that had not been allowed to meet us before showed up and were amazed that we were allowed inside, and apologetic that they had not been allowed to help us.